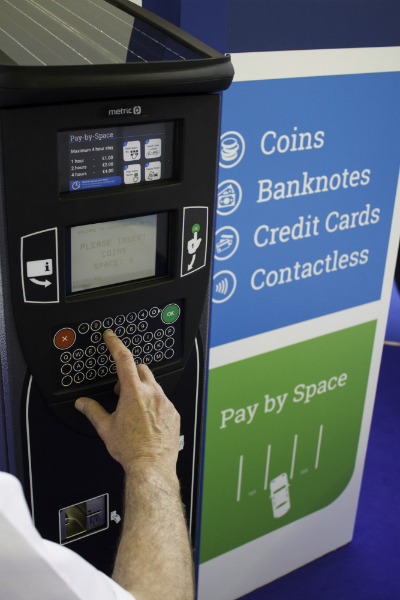 METRIC are proud to launch their new parking terminal, the METRIC Sprite, at the 2016 Intertraffic Conference, at the RAI Amsterdam from 5-8 April. Noticeably slimmer and shorter in stature, this compact parking machine is an attractive piece of street furniture that is packed full of features. Designed for the global market, the METRIC Sprite is perfect to suit a range of parking modes. The capacitive touch keypad is flexible which means it can be updated to include QWERTY keys for Pay-by-Plate and ANPR parking modes or for other types of data capture. The keypad can also include special characters to suit specific language requirements. The focus of the METRIC Sprite is the experience of the end user. The user information screen is clear and prominent to deliver on-screen instructions, and is available in mono, low power SD colour and a large high definition colour option. The METRIC Sprite can handle all payments types including coins, notes, chip & pin and contactless, including ApplePay. Voucher scanning is also a feature that can be used as a payment method to offer free or discounted parking for a number of scenarios such as retail, residential, members and employee parking. Visitors to the Intertraffic Exhibition can enjoy a live demonstration of the new parking terminals visit the METRIC stand 02.212.